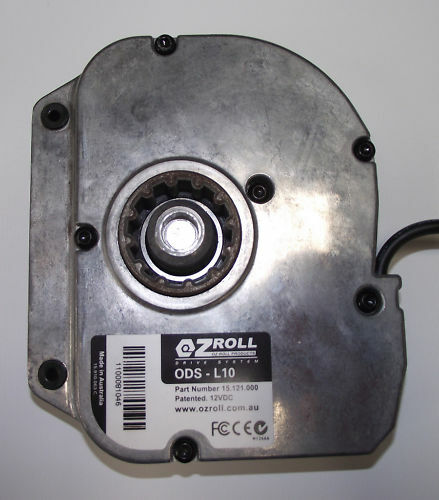 brand new OZROLL ODS L10 mech for your window roller shutter to either replace the one you have or easily change from a manual to battery system ask us how. The L10 battery motor will only fit the 165mm, 180mm and the 205mm head box. not the 150mm. the control 10 mech has been discontinued. To set the internal down stop to memory push the down button on the controller, the motor will do a cycle and stop, then push the down button on the controller again, this will then lock the position into its memory. Any small adjustments required will be a case of simply disengaging the axle adaptor from the L10 mech and rotating the axle to the correct position. The axle can be rotated in increments of 30 degrees and once the bottom limit is set correctly the axle can then be fixed to the mech. Please note: This L10 battery motor may not be suitable for a moist tropical climate, we recommend that the T20 battery motor is use instead. Upgrade to the T20 motor.